Loyd writes: This is a live recording of Adriana de los Santos & Andrea Pensado. They utilized laptops with midi programmed controllers, yamaha keyboard, and various traditional violin-like instruments. A collaborative palette between each performer was established as the two fed off of the calamity or subtle tone each was contributing to the mix. This recording is broken into two segments and is around 20 minutes long. Andrea Pensado is an Argentinean performer, composer and teacher. She has been working with digital media and performing using live interactive musical systems since 1995. 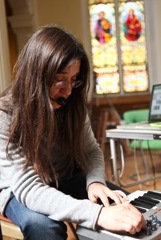 After studying composition (in Argentina and Poland), she gradually turned into different sound realms. The abrasive digital noise of these days is far away from her earlier acoustic pieces. Harsh dense layers of sounds, often interwoven with her voice, combine hybrid synthesis and sampling techniques to create a highly personal sound language, which reflects an intuitive, emotional and paradoxically also logical approach to music making. Adriana de los Santos will perform using toba violins with electronics (the tobas are an ethnic group from the north of Argentina). 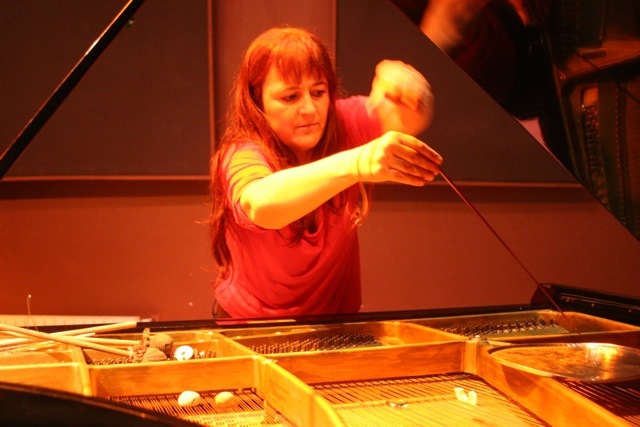 She will also use home made motors especially built to process acoustic instruments, mostly the piano, and a table with different types of home objects. She says: "The reality of our countries makes it very difficult to work with new technologies. This fact has a direct influence in my aesthetic choices both working alone or in groups. The idea is to produce music which represents our socioeconomic reality and its impact in our culture. This is just one more way of the activism I am involved with not only in music but in all movements which defend the rights of musicians and artists in Argentina and the rest of Latin America." Adriana de los Santos & Andrea Pensado 025, a photo by jim leftwich on Flickr. Adriana de los Santos & Andrea Pensado 029, a photo by jim leftwich on Flickr. Adriana de los Santos & Andrea Pensado 030, a photo by jim leftwich on Flickr. Adriana de los Santos & Andrea Pensado 033, a photo by jim leftwich on Flickr. Adriana de los Santos & Andrea Pensado 032, a photo by jim leftwich on Flickr. Adriana de los Santos & Andrea Pensado 031, a photo by jim leftwich on Flickr. Adriana de los Santos & Andrea Pensado 047, a photo by jim leftwich on Flickr. Adriana de los Santos & Andrea Pensado 046, a photo by jim leftwich on Flickr. Adriana de los Santos & Andrea Pensado 045, a photo by jim leftwich on Flickr. Adriana de los Santos el otro tango 002, a photo by jim leftwich on Flickr. Andrea Pensado KTOTAM 005, a photo by jim leftwich on Flickr. pansemic playhouse 42 006, a photo by jim leftwich on Flickr. pansemic playhouse 42 009, a photo by jim leftwich on Flickr. strategies of institutional pansemic critique playhouse, a photo by jim leftwich on Flickr. strategies of institutional pansemic critique playhouse2, a photo by jim leftwich on Flickr. Marton Koppany - Ellipsis No. 16, a photo by jim leftwich on Flickr. Marton Koppany - Asemic Table No. 4, a photo by jim leftwich on Flickr.